Take a look through our vast range of outdoor ovens and you are guaranteed to find the perfect one for your home or restaurant. Not only do they make great pizza but they can be used for many other types of cuisine. They are famous for pizzas in Italy, but equally famous in Greece for Kleftico which is a slow cooked lamb dish. You will also find you can make a mean roast in our outdoor ovens. 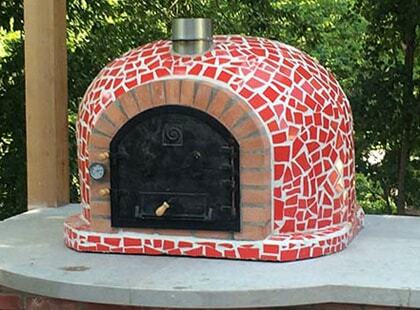 Garden ovens are the perfect outdoor cooking essential. The unique cooking style adds a delicious smoky taste to your food, making your taste buds tingle. Whether you want to smoke some meat, roast some veg or bake the perfect imitation Italian pizza, our selection of versatile outdoor ovens will deliver you a selection of culinary delights. Here at Garden Gift Shop we have a wide range of outdoor ovens and accessories. Whether you prefer a gas fired oven or wood burning oven, you will be able to find some of the biggest names at fantastic prices in our range. Outdoor ovens are the most versatile piece of outdoor cooking equipment on the market. You can cook a whole host of delicious recipes. From the perfect pizza to a succulent joint of meat, your outdoor oven can host most of your favourite meals. Our garden ovens also have a multi-purpose function. Most people position their ovens on the patio so they can sit back on a warm summers evening and watch their dinner cook right in front of them, but they also use the ovens as a fire pit and heater. Our outdoor ovens come in attractive designs which helps to create a romantic ambience when spending those warm summer evenings in the garden with loved one. The soaring temperatures an outdoor oven also help you to brave the outdoor weather all year round, as they make great patio heaters. Of course, while your garden oven can be used as a heater or fire pit on its own, it is very rarely done so. Most people can’t resist the temptation so be warned once you lit, it’s likely you’ll be cooking up some amazing delights for dinner. Not only are our outdoor ovens capable of cooking a wide range of delicacies they are also easy to use and build. Our ovens come fully constructed so you won’t have to try and build the structures. You may require several people however to move your new oven into position – whereas some of our brands produce lightweight ovens with wheels to make transporting easier, some of our larger models with stunning brick designs can be quite heavy. You will need assistance when moving these. Our outdoor oven range features a wide range of wood burning ovens. 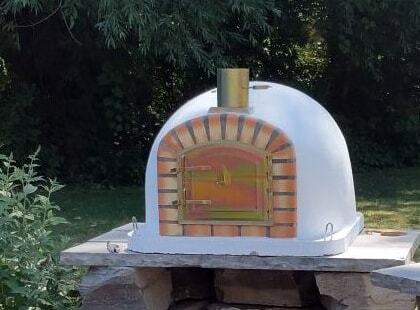 Wood burning ovens are the most popular style of outdoor oven because of their unique tastes. Wood fired food adds a unique smoky taste which not only improves blander foods but also enriches the spices of any marinades. You do have to be careful when selecting wood for your wood burning oven. While the clue is seemingly in the title you, use wood for the fire, it’s actually not that simple. Some laminated woods like plywood or wood that has been varnished or painted may release chemicals into your food when cooking. They can also create a larger amount of smoke and may be harder to control when burning. 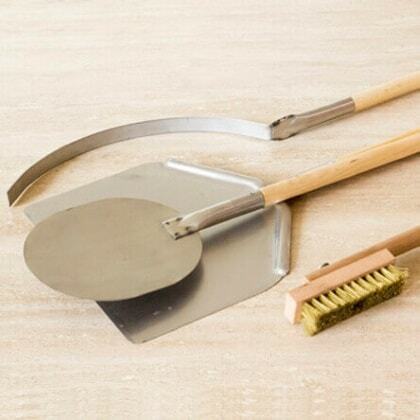 We recommend you use hardwoods for cooking like oak but you can also use wood chips or wood pellets for cooking. Regardless of your fuel choice, you will still get that amazing distinct taste that only cooking in a wood fired oven is capable of producing. If you do opt for wood chips however you can opt to buy flavoured chips, perhaps apple wood chips, that add an aroma to your food when cooking heightening the smell around your cooking environment but also adjusting the flavours of your food. We stock only the highest quality ovens from leading manufacturers. As you view our range I’m sure you’ll start to recognise some of the brands, and the fantastic prices at which we stock their products. We only want to deliver you quality - so when choosing our range of outdoor ovens we consider longevity and reliability, a variety of styles (whether that’s in regards to fuel types and function or their appearance, we like to cover all areas), reviews and the speciality of brands. We do our homework before selecting our product range so you can trust that when you shop with us, you’ll only receive the best. 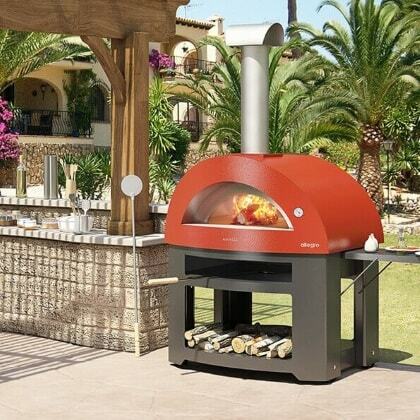 You will see our pizza oven range contains a large amount of ovens from the Alfa Pizza range. 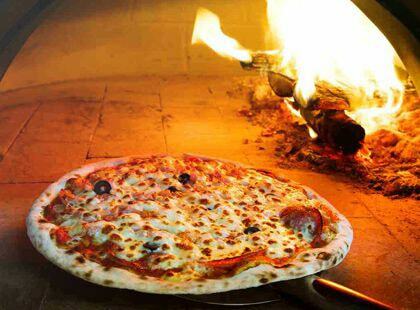 Alfa Pizza are renowned for their backyard wood fired ovens. 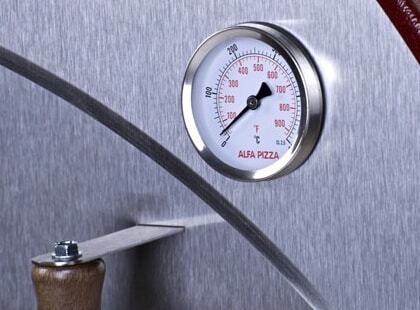 Alfa Pizza’s oven range contain brick or stainless steel ovens, depending on your preference, and they have been made in a revolutionary way that makes them so simple to use. They also use advanced technology to make the ovens lightweight – and combined with their large wheels this makes them easy to transport. This is ideal should you want to store it away in the garage when not using but also advantageous for taking away with you. We believe in the quality of Alfa Pizza so you will find a wide range of their ovens, cookbooks and accessories in our outdoor oven shop. You will also notice we stock the likes of Fornetto – an equally excellent brand that produces high quality ovens. Fornetto stock the finest multi-purpose pizza ovens and smokers so you’re getting more for your money with their range. If you love outdoor cooking – whether that’s BBQing, smoking or baking that perfect pizza – you need to check out their ovens in our range, we guarantee you will be more than impressed. Outdoor ovens come in a variety of styles and designs so it is important when selecting one for your garden that you know what to take into consideration. We’ve put together a buying guide looking at all the different factors that distinguish outdoor ovens so if you’re on the lookout have a read of our guide. 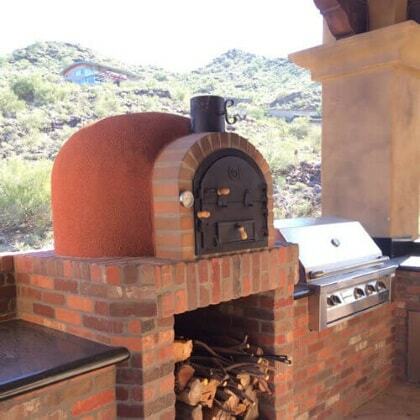 At Garden Gift Shop, we get asked many questions about our outdoor ovens. To help you choose the right oven for you, we have decided to put together a list of our most frequently asked questions from other customers who have bought our ovens. From assembly to painting advice, we have a varied list of questions that will hopefully answer all your queries. Brick outdoor ovens require curing before use. This is to protect your oven against cracks and ensure it lasts for a long period of time. We don’t recommend you miss or rush this step, as cracks in an outdoor oven can affect airflow which will negate your cooking efforts. One of the benefits of outdoor ovens is that they reach higher cooking temperatures than conventional ovens. This is partly because of the insulating materials they use but also due to the larger dimensions and cooking space. We’ve put together a temperature guide to help you when cooking in your outdoor oven.